Finding cheap rattan garden furniture is a bit like playing hide-and-seek. There are bargains out there, but you have to look for them. Rattan, the bark and interior reed of the climbing palm, is sold as wicker, cane, and reed as well as rattan. This can be a little confusing because wicker is a catch-all phrase for other types of woven materials, like willow, too. At the beginning of the spring season, there's a lot of rattan to choose from for patio and deck applications, but prices are typically high. After the season, you can pick up bargains for a short time, but when the weather starts to turn, selections dwindle until next season. If you go for the more upscale interior design rattan and wicker, you pay more and the design and preparation of the pieces, weatherproofing and fabric, are more geared for interior use. Take advantage of end-of-season sales in late summer and fall. Overstocked retailers will often unload seasonal items, like woven furniture, at big discounts. Your best strategy here is to target an item and follow the in-store sales. Not all clearance sales are advertised, so visit frequently. If you feel brave, ask the department manager if he'll give you an additional discount for cash. Check out stores that have the clout to buy in volume for less. Your nearest national variety outlet, like a Target or Wal-Mart, may have the piece you need at a price you can afford. Lower costs to them translate to lower prices for you. If you want to personalize your purchase, consider making custom cushion covers or employing decorative pillows. Order online. Many online direct-to-the-customer outlets sell wholesale too, and provide no-frills packages at low prices. What they save in not having a brick-and-mortar presence in your community enables them to beat the price of local retailers. You may be able to source the style and quality you want for up to 20 percent less. Don't forget hidden costs, though, like freight and handling. Make sure to factor all landed costs before you buy, and look for sellers that offer additional discounts on freight for volume purchases. You may end up paying more, but you'll get more in the bargain. Rehabilitate a flea market find. When rattan furniture begins to show wear, it may still have years of useful life left. If you're crafty, in more ways than one, you can make someone else's castoff your furniture masterpiece. If it doesn't have structural damage, a little varnish or paint and some new cushions can go a long way toward refurbishing a neglected piece of rattan furniture. Join a discount club. Membership clubs charge a periodic (often annual) fee that allows you access to close-to-wholesale goods, either from a mail order vendor or via large regional warehouse locations. The strategy here is for people to aggregate their purchasing power in order to get better than retail discounts. If you're considering joining, just be sure that you'll realize enough of a savings to justify the membership fee. Clean rattan furniture on a regular monthly schedule with mild dish soap and water. Once clean, wipe surfaces dry with a soft cloth. Use a soft utility brush to clean crevices and joints periodically. 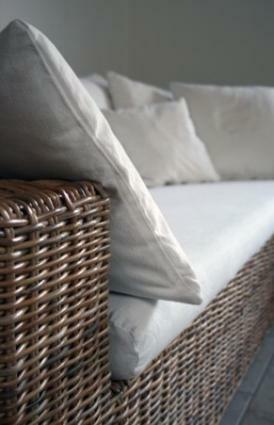 Although rattan is sturdy and can withstand some abuse, it will look good longer if you protect it from the elements. This means keeping it out of the rain and protecting it from damaging sunlight. Tackle problems immediately. If you see spots or the beginning of a split, get on it right away. Address splits by lubricating the area with linseed oil, or follow the manufacturer's directions for minor repairs. You can take measures before there are problems too. Good maintenance practices include treating cushions with stain and moisture protection, and keeping the rattan clean and lubricated. Protect chair and table legs from concussion splits by installing rubber cushioning under legs. Re-lacquer pieces annually to keep your cheap rattan garden furniture looking good for years.